Fleur is a blanket appaloosa, standing at about 15.2 HH. Her base color is a minty-teal, with her spots being an emerald green. Across the coup of her back there is a thick cerulean blue strip that continues down her sides tapering off to a point just below the point of her hip on both sides. A few blue spots speckle the top of her back leading up to another blue stripe around her heartgirth. Going down her legs, there are blue stripes around her hocks and knees, respectively. Moving to her lightly curved face her honey eyes are masked by blue and her nose fades into the same cerulean hue. Her mane and tail are long and flowing, starting blue and fading in an ombre to teal. Fleur's hooves are black, standing out against her otherwise colorful body. 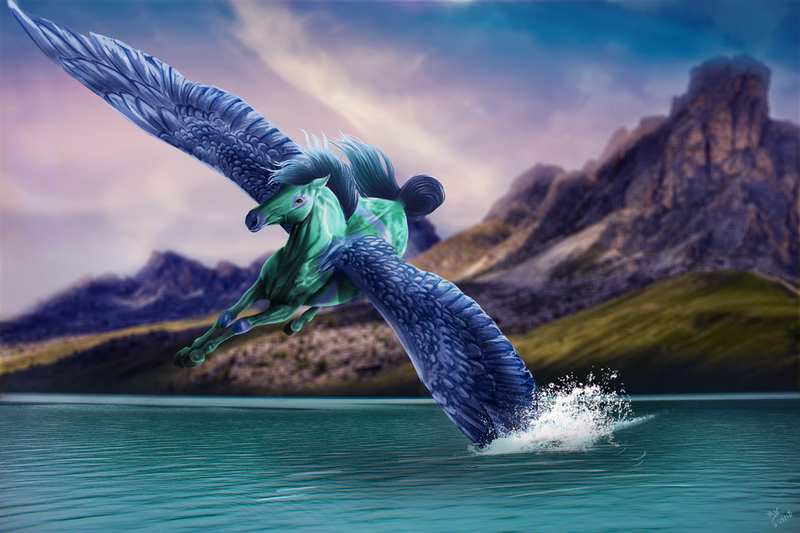 However striking Fleur's coloring may be, her most notable feature is her large blue pegasus wings. Fleur is sweet and kind. She always finds a way to make sure others around her are alright, often playing peacekeeper among friends. While she is a peacekeeper, that isn't to say she doesn't have limits or things that do make her mad. While it takes a lot to get her to the point where she is angry, once that line is crossed she is a force to be reckoned with. When it comes down to it Fleur feels her emotions fully, and is very in tune with her feelings, and is a bit of an empath. Her emotions often sit on the surface and there is little she can do to mask them, this often leads her to be highly emotional. She is prone to fits of tears due to how fully she feels, which often makes her seem a touch unstable. However, she is true friend once made, and very loyal. Fleur was born into a world of color. All the equines and similar kin were beautifully colored with fantastic designs and intricate patterns. She herself was boldly colored, but in terms of her birth world, she was rather tame. After two years of her life with her family, she fell through a veil and ended up in a world fractioned between day and night. Half the word was eternally night while the other was eternally day. There she met Killdare and they became fast friends, and she followed him to Scarwood where he claimed the space for himself and for those he protected. Fleur fell into a calm cycle of life, moving through her days split between land and sky. All was well, in her happy, all be it sleepy, world until one of the gods of the land got bored and magiced the water to make anyone who drank it fall in love with the first person they saw. For Fleur that was Kjartan, a grey stallion that taught her the ways of a lover, and quickly stole a piece of her heart that lasted even after the magic faded. But overwhelmed by the effects of the magic, Fleur fled, and left Kjartan with the emotional feeling of her home leaving it to him to find her in their own twisted tale of Cinderella. Months past and Fleur waited for her love to return to her, trusting that if it was meant to be he would find her. She never strayed from the border of Scarwood, unless she was in the sky easing her aching heart with the open sky that she adored so. But even as she ached she found herself drawn o Killdare, a tender caring had always been between them, until one day it bloomed into something more. And she finally left the border and forced her self to let go of the life that could have been with Kjartan. She and Killdare spent more time together and there was a tender affection between them. Soft and gentle, it was slow growing- a day at a time, they had said. And she was happy, until about a year and a half after the water was magic and her life turned upside down, she found Kjartan once more after fearing the worse for him. It brought everything back to the surface. She tried to ignore the stirring of feeling, but it eventually became the driving force that ended her relationship with Killdare. But even as she ended things with Killdare there was too much hurt and time between Kjartan and herself, and they didn't fall together. THe fought, and things were said-- things that could not be taken back. And even as it was so clear they were so taken by the other they had yet to heal on their own-- and they were only hurting each other. A love lost through circumstances and assumptions left Fleur heartbroken, and she took from Scarwood, and the land of eternal day and night. She flew far, her wings strong from all the hours in the sky until twilight was all around her the stars swirled about and she found another island in the nothingness. She was alone and the world was quiet-- and she was alone with her heartache. She mourned her broken heart, and her inability to stay, the loss of her home, her friends, and her Kjartan. Weeks passed and she did little more than cry, her sobs echoing in the nothingness around her. Until one day a fog rolled onto shore, engulfing her. She walked blinded for some time until finally, the fog cleared revealing a whole new world. With nothing to stay on the lone island for and going back being too painful-- she accepted her fate, open to a new start and maybe a way to forget the grey stallion that haunted her dreams.